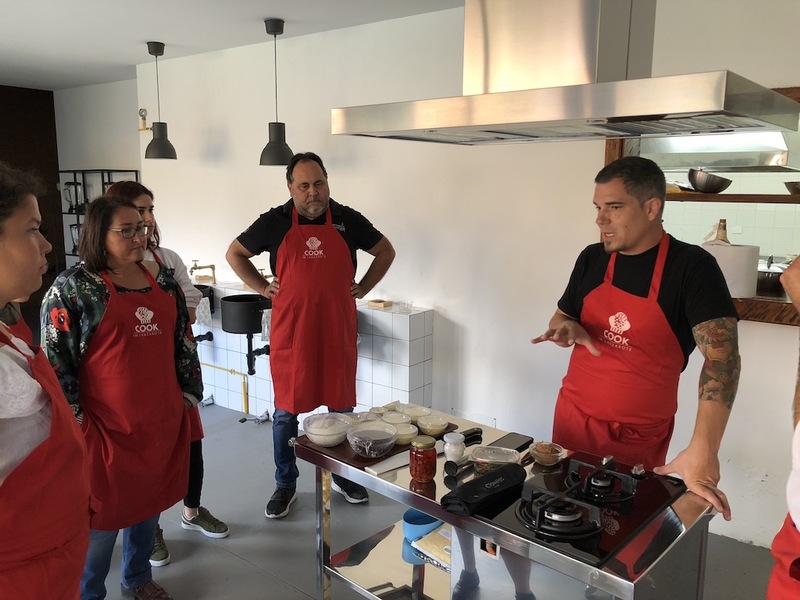 I had a real treat this week when I joined 5 others at Cook in Lanzarote to learn to cook some dishes with award winning chef João Faraco – recently voted the top chef in the islands. The event took place at Cook In Lanzarote‘s fabulous premises in Uga, and was attended by a local television crew. When we arrived we were greeted by Antonio, one of the owners of Cook in Lanzarote, and issued with our smart red aprons. João, who is Brazilian, started by explaining his cooking philosophy, which is based on using the very best local ingredients as a base, and then adding his own spin on creating the flavours he wants to share. At Cook in Lanzarote, you’re assigned your own work station and cooking rings, with all the pots, pans and implements you need, and all the ingredients are pre-prepared for you. There’s no chopping to do! And as you use everything, it’s cleared away for you – you feel like a professional chef with a team working in the background. For each dish, João and Antonio explained the process and the background, and then we were let loose to create our version, watched over and helped by them at every stage. These are Brazilian chicken croquettes. We poached the chicken in stock, then added it to a salsa we had made and then created a kind of choux pastry with the stock, which we then used to wrap the shredded chicken. Each “ball” was then dredged in flour, egg and breadcrumbs and deep fried. The croquettes were tasty, with a crunchy outside, contrasting with the soft pastry inside and the flavourful chicken mix. Using fabulous fresh chunks of Cherne, we prepared a vegetable base which was fried then steamed, and then poached the fish and vegetables in coconut milk. This was served with rice and a polenta dish called Pirão. This dish was delicious and my favourite. Quite simple to prepare, but bursting with a clean zesty freshness. I’ve promised to do this at home over the weekend. So simple, but so wonderful! We melted the best chocolate into condensed milk and then allowed it to cool. Next, we rolled the mixture into balls and dredged them with either coconut flakes or chocolate pieces. These were gorgeous, but so rich, one at a time is fine. In between various dishes, João showed us how to cook a couple of quick and easy Brazilian snacks. First we took some goat’s cheese, very similar to Haloumi, and dry fried chunks until they were brown. Apparently, in Brazil, guys with mini barbecues strapped onto their bodies sell chunks of cheese like this on the beaches. We also took some skewered prawns and dredged them in a type of palm seed before deep frying them. Similar to sesame seeds, but with a unique flavour, the crunchy prawns are another dish I’ll be reproducing at home. We were also shown how to make Brazil’s national cocktail. We quartered limes and removed the membrane, added sugar, ice and Cachaça (a spirit made from sugar cane) and then mixed the whole lot. I loved it -zesty, fresh, sweet and sour. Afterwards, we all sat at a long table and enjoyed the fruits of our labour with some excellent wine. I had a fabulous time, learned a lot and really enjoyed the whole experience. I will certainly be back to learn some more in the future. If you enjoy cooking and like learning the skills, the team run different courses all through the year – tapas classes, vegan cooking, curries and much more. 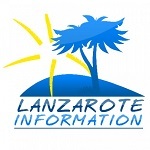 Find out all about them here: Cook in Lanzarote.